With hundreds of employees walking in and out of your facility daily, it's inevitable that dirt, stains, and spills will appear. This article is directed to help you to identify which products work best when it comes to cleaning and maintaining your carpets. When it comes to cleaning carpet many focus on the process itself, but spend little time researching and selecting which products work best. Failure to choose the right shampoo will not only waste your time and resources on an ineffective product, but also could put your carpet at risk for damage. There are an abundance of carpet cleaning shampoos out there so how do you know which one is the best for your cleaning needs? The keyword you want to look for when it comes to choosing a carpet cleaning shampoo is zero residue. 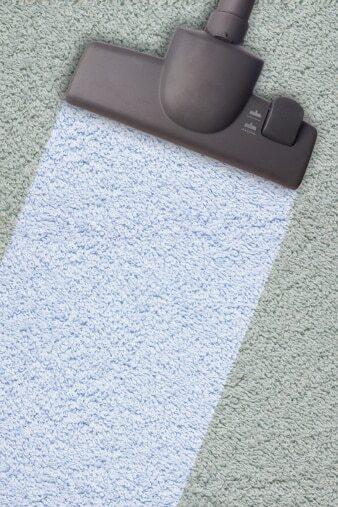 Always make sure to look for the words “zero residue” when purchasing a rug and carpet cleaner. Why is a zero residue shampoo superior? As the name implies, a zero residue shampoo means that very little, if any, residue will be left behind during the cleaning process. This is essential in maintaining a clean carpet for a long period of time. Why? Soaps and detergents are sticky. Therefore, any residue left behind in the carpet can and will attract dirt. If you are using a shampoo that leaves behind residue, you will quickly notice it in the high traffic areas. Every time someone walks on the carpet, any dirt brought in from their shoes will stick to the left over residue thus leaving dark spots on your carpet. Over time, these spots will increase in size and color as more dirt is 'sticking' to the area. If you notice these spots or stains appear only a few weeks after your carpets have been cleaned, the shampoo is too blame. It may just be the reminder you need to switch to a new shampoo, one that leaves zero residue. Rug Shampoo works very well in cleaning carpet, but also maintaining that clean look. Rug shampoo is a high foaming dry shampoo that leaves zero residue behind as well as a fresh scent. The dry shampoo can be vacuumed up after the application, but it should be used with a carpet extractor for best results. The best part of it all is that it won't discolor, damage or stiffen the carpet fibers ensuring your carpet preserves that ‘new carpet' look. Another tip to keep your carpets clean is to address spills and stains properly. It is only a matter of time when a coffee spill or some other stain will appear. By addressing these stains properly not only will your carpet look as if that spill never happened, but it will also last longer too. Vacuum, vacuum, vacuum. A build up of dust, hair, debris and anything else that might be in your carpet can lead to stains. Regularly vacuuming your carpet acts as a preventative measure in keeping it clean and keeping those stains away. Attend to stain immediately. The key to stopping a stain from becoming impossible to get out is to address it right away. Remove as much of the spill from the carpet as possible. This can be done by taking an absorbent white towel and blotting the area. After you have absorbed as much of the stain as possible, apply a warm wet sponge to the area to try to extract any remaining residue. If the stain is still there, apply carpet cleaner immediately to retract the rest of the spill. Control the spill. Another important thing you want to do is to contain the spill to one area. By doing this the spill will affect only a small portion rather than spreading and affecting a much larger area. In order to contain a spill, cleaning products such as the one mentioned above should be sprayed around the area of the spill. Use a stain remover. At times you may need something a little more powerful in getting out stains, especially set-in stains. A great product for removing set-in stains is Carpet Spot & Stain Remover. It comes in an aerosol can which makes it easy to spray the exact amount you want. It works great for those difficult stains such as tar, oil, paint, ink, coffee, shoe polish, blood and even gum. It leaves behind no residue and it's effective on both oil and water-based spills. Best of all, it's easy to use. Simply apply it to the affected area, gently agitate and allow to dwell and then lastly rinse with a sponge or microfiber cloth. Replacing the carpet at your facility could cost hundreds or even thousands of dollars. By following the steps above and choosing the right carpet cleaner not only will your carpets look spotless, but you will enjoy them for years to come. This entry was posted in Floor Care, General Cleaning, Janitorial and tagged carpet, foam cleaner, remover, rug, rug shampoo, shampoo, stain. Bookmark the permalink.